The Heart Rules is Guru Prem Singh's answer to the question of Love and Yoga. You have to become love in order to understand it. Same in Yoga. You have to put your whole heart into it in order to understand an asana or kriya. Letting the position of your heart guide the way you inhabit your body, allows you to begin to embody love, and that leads you to the "asana", the "comfortable seat", which is the easy way to live and to do yoga. 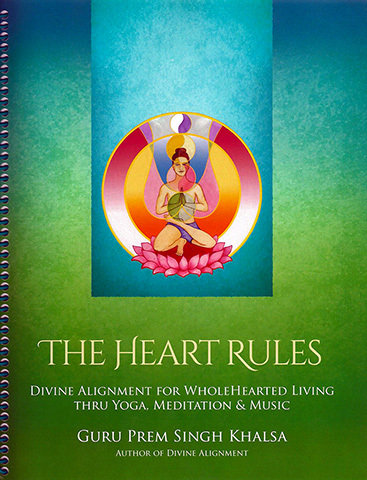 The Heart Rules music and mantra collection comes as an MP3 file, downloadable from your library when you purchase the eBook. In the first section, Recognition, you will try on a new image of yourself as a heart-ruled human. You will begin by changing the way you think about your body, and then explore how to put your heart in a ruling position, what it takes physically, and how the breath supports that. In Reclamation you will see how your new heart-ruled body image helps you work specifically on opening up the shoulders and the hips. This section includes 7 Kundalini Yoga kriyas. In Realization you will first look into the achievement of a comfortable sitting posture, because the more comfortable your seat, the more comfortable the meditation will be, and the more deeply and joyfully you can experience it. Following that you will explore different manifestations of heart energy, and try meditations that develop these aspects of the heart. Guru Prem Singh Khalsa has been a Yoga Teacher for over 30 years. A former student of the late Yogi Bhajan, he is KRI-certified as a Trainer of Teachers of Kundalini Yoga. He travels throughout the world teaching the principles of Divine Alignment to students of many yogic schools.